To Cite: Xu S, Sheng W, Qiu Y, Wang J. 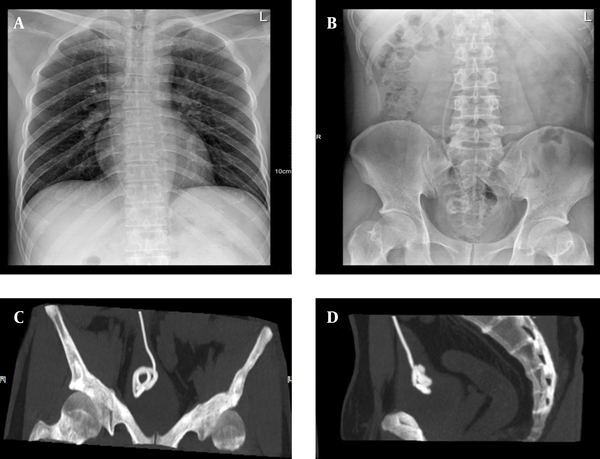 An Unusual Complication of Ventriculoperitoneal Shunt: Urinary Bladder Stone Case Report and Literature Review, Iran Red Crescent Med J. 2016 ; 18(1):e26049. doi: 10.5812/ircmj.26049. Introduction: Ventriculoperitoneal (V-P) shunt surgery is the most common technique used for the treatment of hydrocephalus. The migration of ventriculoperitoneal shunt to the bladder is rare. Only two cases have been previously reported in the literature. Case Presentation: We report on a 38-year-old male who had hydrocephalus and V-P shunt for 12 years. Two years ago, he found himself with recurrent urinary tract infections, haematuria and urges incontinence, and then he was diagnosed with bladder perforation and merge stones. The patient had an abdominal operation to cut off and take out the shunt catheter, as well as a transurethral holmium laser lithotripsy. Conclusions: Bladder perforation and stones are rare examples of complications in V-P surgical procedures. Controlling the effective length of the terminal V-P shunt and modifying it appropriately can effectively reduce these complications. Hydrocephalus is typically managed with the division of the cerebrospinal fluid (CSF) through V-P shunting (1, 2). However, the main obstacles of current techniques are complications such as shunt obstruction, infections and migration. Infection and obstruction are the most common complications, while migration of distal or proximal tube are very rare cases (3-5). The migration of ventriculoperitoneal shunt to the bladder has only been reported for two cases in the literature (6, 7). Here, we report on one case in which the patient had hydrocephalus and shunt insertion and later he was found with distal catheter migration and coiling inside the bladder. The possibility of pathophysiology and mechanisms are discussed. The patient was a 38-year-old male with hydrocephalus who had the V-P shunt operation 12 years ago. After the operation, he recovered quite well without any fever, headache, nausea, vomiting, coma and other symptoms. However, he had suffered from frequent urination, dysuria, urodynia and other symptoms of irritation of the bladder since two years ago, and these symptoms became even worse day by day. On the 9th of July 2012, an X-ray examination of the patient showed that there was a tubular shadow in the bladder, abdomen and the chest (Figure 1A and B). On the 11th of July 2012, computerized tomography (CT) scan showed that there was a tubular shadow in the abdomen and the bladder (Figure 1C and D). With the help of cystoscopy examinations, we found that there was a tube in the bladder as well as some stones on its surface (Figure 2A and B). After obtaining permission from the patient, he had an abdominal operation, which was close to the bladder wall to cut the shunt catheter to two parts with scissors, and the abdominal incision was then closed. The cystoscope was placed in the bladder through the urethra. The foreign body forceps was placed in the bladder through the operation hole of the cystoscope, and the shunt catheter was pulled into the bladder completely by the forceps. Next, the laser fiber was placed into the bladder through the operation hole of the cystoscope and the stone on the surface of the shunt catheter was crushed with the holmium laser. The shunt catheter was taken out by the foreign body forceps. Seven months later, a cystoscopy was performed for following up the effect of the operation; it showed that there was no foreign body left in the bladder (Figure 2C). The patient has been followed up clinically and has had no other complications until now. A, X-ray showing a tubular shadow in the chest and abdomen; and B, in the bladder; C and D, the CT scan showing a tubular shadow in the abdomen and the bladder. A and B, A tubular shunt and some stones on its surface in the bladder; C, there was no foreign body left in the bladder after the operation. The V-P shunt is a common surgical treatment of hydrocephalus, because it is easy and reliable. Its postoperative complications can be shunt obstruction, intracranial infections, shunt subcutaneous infections, abdominal infections, intestinal perforation and so on. Bladder injury together with merge stones is indeed a rare complication. Bladder is an extraperitoneal organ when it is empty and is an inter-peritoneal organ only when it is filled. Placing a catheter into the bladder before surgery is a common practice, so the bladder is empty during the operation. There is a peritoneum between the shunt catheter and the bladder, and the bladder wall is very tough, so it is very rare to damage the bladder during the surgery. In this case, there might have been many factors that caused the patient’s abdominal end of shunt tube to come into the bladder, yet the most significant cause was the length of the abdomen part of the shunt. We thought that the shunt tube might migrate and move into the sag of the bladder along with the gastrointestinal movements after the surgery. The shunt rubbed the peritoneum constantly, which led to inflammation and fibrosis. It perforated the peritoneum, and moved into the bladder gradually. The shunt catheter in the bladder created a nidus for stone formation. Various crystals in the urine attached on its surface, and gradually formed stones. The composition of CSF is different from that of the urine. It can lead to supersaturation of urine, promoting encrustation and stone formation (8, 9). Bladder stones can lead to bladder or intracranial infections, bladder outlet obstruction, hydroureteronephrosis and obstructive renal failure (10, 11). Thus, the length of ventricles-peritoneal shunt should be taken into consideration when the operation is performed. Controlling the effective length of the terminal V-P shunt and modifying it appropriately can effectively reduce these complications. Regarding V-P patients with recurrent urinary tract infections and other symptoms, we should take into account the possibility of the existence of such complications. Authors’ Contribution: Jianguo Wang and Songtao Xu designed the research and wrote the paper. Weixin Sheng and Yufa Qiu collected and analyzed the data. Songtao Xu, Weixin Sheng and Yufa Qiu are equal contributors. Funding/Support: This work was supported by the natural science foundation of Luohe medical college, P.R.C. (No. 2013-DF-002, 2014-S-LMC08). This work was also supported by the 2015 basic and advanced technology research project of Henan province, P. R. C (No. 152300410177).